What's going on in #Ankara & #Istanbul? Reports of significant military presence in urban areas in Turkey. Two Istanbul bridges on lockdown by military. Bosporus Bridge currently blocked by Turkish Military. Everybody is asking: what is going on? Turkey. Istanbul. 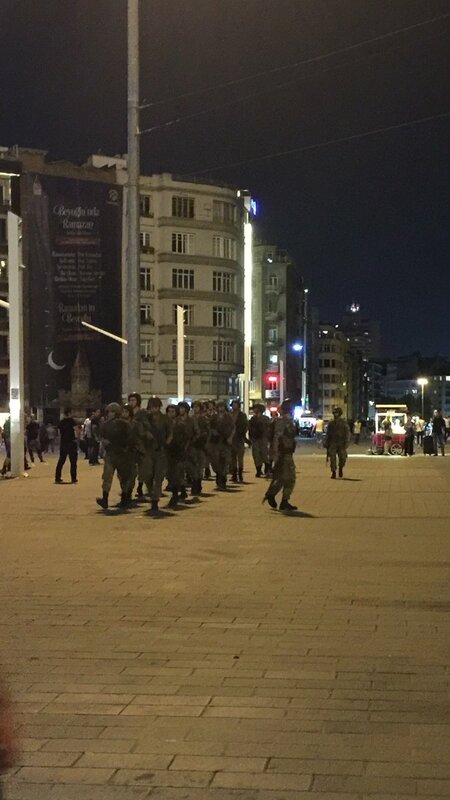 Police in Istanbul are being disarmed by the Military. Rumours of a militart coup d'etat in Turkey after opposition news website @Haberdar published story on skirmishes b'ween police & soldiers. Another Istanbul friend tells me people in the streets exchanging rumors, "there's a coup", some say "finally we'll be free"
Unconfirmed reports suggest a nationwide military martial law declared by #Turkish Army. Turkish military jets flying over #Ankara. #Istanbul #Ankara What the feck ..? #pts - #Turkey soldier reportedly says a coup has taken place & civilians should stay at home. #pts - #Turkey’s Prime Minister Yıldırım says “a coup” has been attempted by “some sections” of the military. “This will not be allowed." Thanks, LL - the world has gone so bonkers, I can't keep up with it any more. I wonder how the PM thinks he's going to stop the coup, what with the other side having all those guns, tanks and fighter jets? Both of the main bridges in the Turkish city of Istanbul have been closed by security forces, reports say. Traffic has been stopped from crossing both the Bosphorus and Fatih Sultan Mehmet bridges, but no reasons have been given. There are also reports of military aircraft flying over the capital Ankara, with gunshots heard. It is unclear if the events are related and there has been no official information so far on the deployments. Er, it's quite hard to get 'official' information when the military is slinging out the government. Erdrogan is on his holidays in Bodrun, apparently. 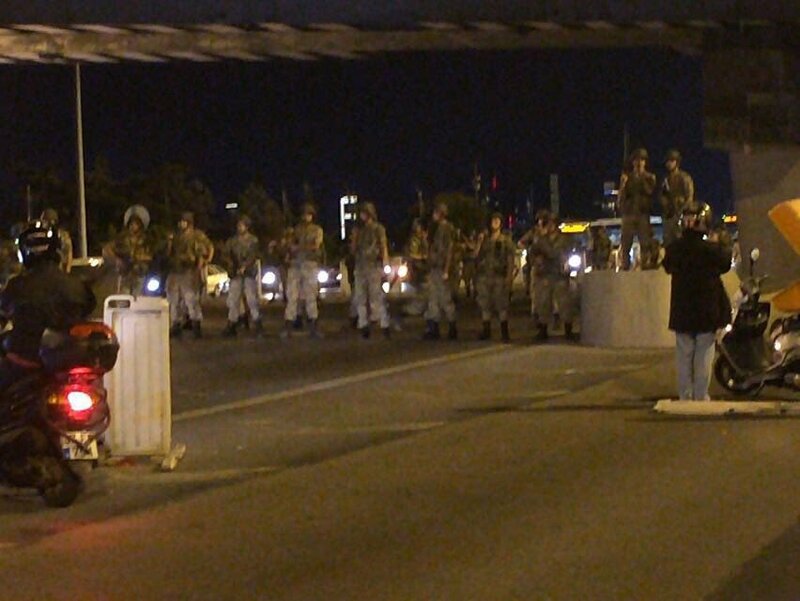 BREAKING 2 bridges closed by mil police in #Istanbul, tanks on highways, reports of jets flying low in #Ankara. " Turkish Military statement says it has seized control of Govt to "restore democracy"
If they follow in the footsteps of the illustrious Ataturk, it can only be an improvement. 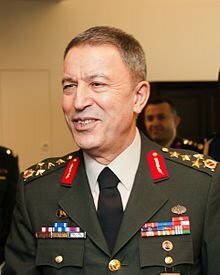 Turkish Army Chief announces "Turkey is under military control". Jets and helicopters fly overhead in Turkish capital of Ankara, as military closes two major bridges in Istanbul. Turkish Prime Minister Binali Yildirim has announced that a group of military forces have engaged in a "coup attempt" against the government. Yildirim made the announcement late on Friday, as he vowed that the "perpetrators" will be contained. He said that a number of generals are involved in the takeover of the government, adding that it "will never give up democracy". "It seems there is dissent in the military ranks," Al Jazeera's Zeina Khodr, reporting from Gaziantep, said. Istanbul's Bosphorus Bridge and Fatih Sultan Mehmet Bridge have reportedly been shut down by the Turkish army, local television channels reported, without giving a reason. Dogan News Agency footage showed cars and buses being diverted, according to Reuters. Reuters witnesses in Istanbul, Turkey's largest city, also spotted helicopters overhead. In the capital Ankara, gunshots were heard, as military jets and helicopters were seen flying overhead, a Reuters witness said. Turkey has had a history of coup attempts, the last time being carried out in 1997, which forced the resignation of then-prime minister Nemettin Erbakan. -BreakingNews- Telephones confiscated, #stateTV centre has been stormed. #Turkey #Istanbul More follows. Erdogan has been taken to Marmaris by loyal military. Just as 'er indoors was about to go apoplectic he's just been on the phone. And is staying in the hotel, keeping their heads down. He said lots of military in the street outside, bridges closed, all flights cancelled. According to the famed Sky Sauces, the coup has been successful, the military is in charge, and Erdrogan is nowhere to be found. And anyone who thinks this is bad, should look up Kemal Ataturk, and realise how badly the horrible Erdrogan has betrayed secular Turkey. I am sure tourists will be OK if they stay inside during the first chaos, and hopefully the military will get things under control - just for once, they aren't 100% the bad guys. The twitter feeds are more informative than TV pundits - who are commenting on what they're reading on twitter, mostly, anyway. Thanks Bonny. It does all seem to be pretty confused right now. Which is not helping Mrs J-P stay cool and calm. Will see what develops - bugger all else we can do. I see Erdrogan has surfaced on social media of some description, talking to a journo on a cellphone - the Turkish TV anchors are giving a splendid display of stiff upper lips in all this. Your children getting caught up in a military coup must be high on anyone's nightmare list, Jean-Pierre, but if it's any consolation, the Turkish military are actually fairly sane, and secular - they aren't going to harm tourists, unlike some of the other lunatics in Turkey. J-P, I do feel for you and Mrs J-P. Everything will be all right soon and you will have some amazing stories to tell in the future. In the meantime, maybe you could suggest a fairly stiff drink?